The LaGuardia “One World” Award, established in 2007 by The Fiorello H. LaGuardia Foundation on the 125th anniversary of LaGuardia’s birth, acknowledges leaders who represent the ideals and actions of Mayor LaGuardia as a local leader with global impact. The announcement of the winners of the award is timed to coincide with Mayor LaGuardia’s birthday, December 11. 2008: Mayors Michael R. Bloomberg of New York and Letizia Moratti of Milan, Italy to recognize their influence in the improvement of the quality of life and environment in their respective cities. 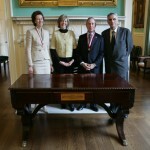 The awards were presented at City Hall in New York City on December 11, 2008 by Dr. Katherine LaGuardia, LaGuardia board chair and co-founder. She was joined by Italy’s Permananent Representative to the United Nations, Ambassador Spatafora (pictured at R). 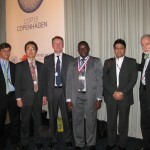 2009: Mr. Bakir Lozane of Lozane Farms, Maputo, Mozambique and Mr. Jose Roberto Fonseca of Instituto Ecoengenho, Maceio, Brazil to recognize their work in clean technology transfer to advance smallholder sustainable agriculture (see Project Cornucopia). The award was presented by LaGuardia Foundation board member and Chief Climate Negotiator for Costa Rica, Dr. Alvaro Umaña and Mr. Elmer Holt, Chairman of the Clean Technology Initiative(CTI) and Climate Negotiator for the United States at the International Center for Environmental Technology Transfer (ICETT) Side Event on Technology Transfer at the 15th Conference of Parties to the United Nations Framework Convention on Climate Change (COP15-UNFCCC) in Copenhagen, Denmark. Mr. Fonseca is a Brazilian entrepreneur responsible for developing H2SOL, a successful solar-powered hydroponic pepper business on small farms in drought-stricken northeast Brazil.